Editor Foreword: This guide goes hand in hand with our artwork image packs. Each pack is created by a different artist who also creates the cover image. The guide below is designed to guide you in creating your own artwork. Enjoy! You can download the PSD and Images used in this article. Then follow along and recreate it, or make your own! My name is Josu Solano, I am a concept artist from Spain working in the entertainment industry. I have worked as a concept artist for video games mostly, doing work ranging from early production pitches to mid production design work. The work I usually do, both personal and most of my professional work, is aiming for realism and as informative as I can in the time given. I created this artwork for the contest hosted by MattePaint.com a couple of months back. The aim was to use a predefined set of photos from the site to create a matte painting. I aimed to do a simple, but very finished 2D matte where every aspect of the image was finished and polished in a way a matte painting needs to be. The piece was worked out over a weekend and was not really planned but was more of a result playing with images until I decided which ones were producing the most exciting image look (which in essence is what the challenge was). So first challenge was coming up with the direction for the piece since there was no concept or direction when I sat down in front of the white canvas. The remedy was simply to fail a lot in a short amount of time, trying possibilities with the sample photos before I committed to something that felt exciting to pursue. If anything, I knew that I wanted to do a natural landscape, but other than that I didn’t have much of a plan. I liked two of the images that were from the same location and could shape a panorama to start from. I also liked the overcast feel to work with in terms of versatility of lighting. These two images are inspiring me, and I can stitch them! Now I started getting an idea of where to move with the image. I will use the overcast feel of the plate but move it towards an Albert Bierstadt (image below) looking painting direction with the epic cloud formations, the pool of light coming in from the background and pockets of light along the the rest of the landscape to guide the eye around. 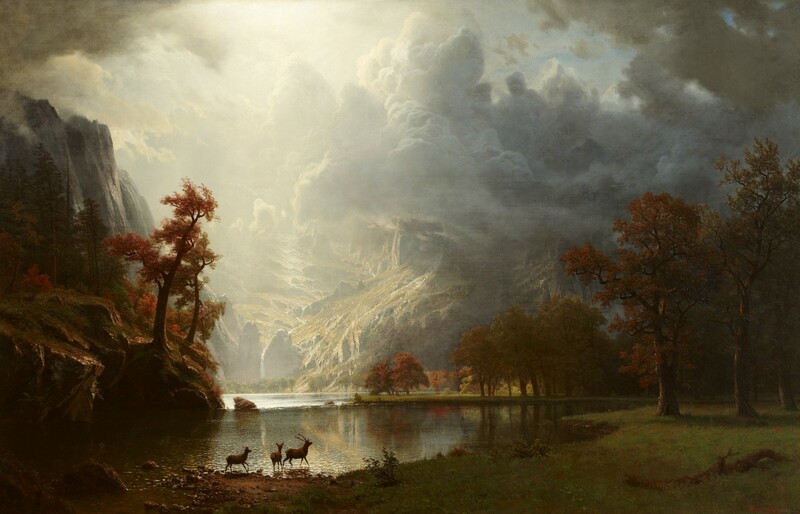 Albert Bierstadt — SierraNevadaMorning, 1870. Oil on canvas. From there I start painting on top, or in this case using photos to add content or enhance what is there matching lighting direction to every new addition. I work from background to foreground (and I do this for pretty much all work I do), although I start jumping around after a given point but is a good method for early stages. As for process during this next steps, it is very much a straight forward one, every single element introduced gets integrated in terms of drawing, value, colour, and light direction. Otherwise it will stand out as something not belonging to the scene. 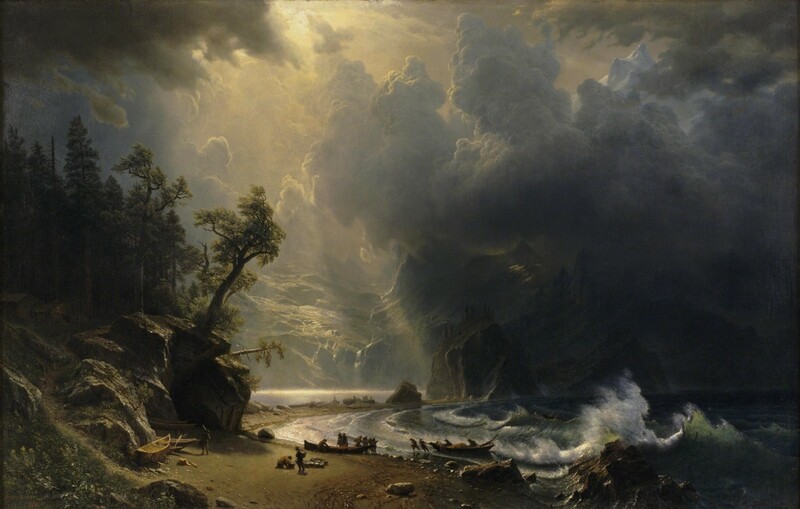 Albert Bierstadt — Puget Sound on the Pacific Coast, 1870. Oil on canvas. In matte painting it is important to grade images as you go — once you confirm the image will work in your composition — because it will keep a consistency to your image, if you miss this step your work will either look like a concept piece or will just look bad. Keep a copy of the un-flattened version! Anyway, so I will integrate the photo first in terms of shape and perspective. Always be aware of your horizon line. It is constant to the entire image, and your images must match this or it will look off. After the photo ‘sits’ properly in the painting I will start to match values; colour, brightness, contrast. I usually put the painting in grey-scale and adjust the values of the new element with levels until its contrast and local values within the current scene lighting feels correct. Note that above I wrote ‘feels correct’. In my case I have no reference to match to so I have to guess, but I highly recommend having a reference to check with and not just guess the result. You will learn more by doing this and your images will look better too! Next is colour, and since we have taken care of the brightness/contrast values, it will be much easier to match hue and saturation. I often use more level adjustments for this but set the layer ‘blending mode’ to ‘colour’. This way, we won’t affect the brightness values that we have corrected previously. Now I’ll zoom in on each layer and go through each colour channel in levels to match hues and saturation to the plate. It’s a different process to what most artists do and it is tricky, but I encourage you to give it a go when matching colours because it’s very powerful. Lastly, if there is any direct lighting or specific areas to address, I will repeat the previous techniques focusing on these areas. Keep these adjustments separate to the previous and control them with layer masks. When matching images, your core tools are: Levels, Curves, Colour Balance and Hue/Saturation. Spend some time to understand the ones you aren’t comfortable with because they each have specific jobs they are best at. Something I find helpful is to introduce the major elements in your image quickly, match them in to a point so you can judge the image at a glance. This is even more important if you don’t have a concept to follow. 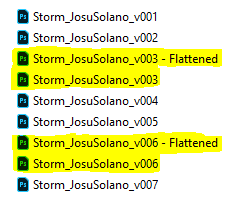 So with that in mind, I had the thought of adding dark rain clouds to give the feel of stormy weather. So I immediately worked them in, not to the point that they look in the final image, but just enough to cover the space they represent in the composition. The same goes for the foreground, just rough something in early. For my foreground, I created an arched space that flows from side to side, leaving much of the lake in the mid-ground visible which helps to pull the eye forward. I also added the focal point of the image, the background mountain, and completely commit to the Bierstadt look we discussed earlier. From here it becomes a process of evaluating every aspect of the image: composition, colour, values, shapes and contrast. It’s now that I introduce the lighting where I create a sense of shade and darkness against sunshine. Creating these areas is much the same process as before, grading and colour correcting the areas I want to add the light to. Check out the ‘match colour’ adjustment if you need to match your layer to another layer or reference image. It’s not always perfect but if you select the right areas it can get you 80% of the way there. Another similar adjustment is ‘selective colour’ which is like the ‘colour balance’ adjustment but more specific to a colour range of the photo. Some of the last aspects to come in were things like the rainbow on the background, the river on the background mountains and the waterfall. At the end, I usually add a group of adjustment layers on-top and grade the whole image to look how I want overall. Then I might add elements like bloom, vignette, lens distortion, defocus and film grain. These final elements are just finishing touches though, so make sure you don’t go overboard with them! I hope this breakdown was helpful and that everyone got something from it. If it feels very simplified as a read it’s because the process in itself is simple, yet it needs the work put in and the process applied to every single bit of the image. A painting is a constant balance of its elements. To get better at this, there is no other way than constant practice and study of the subject matter and the process of creating art. The journey will involves hard work but if you direct that hard work it will be much more achievable. Get the PSD and images — click here to create your own!